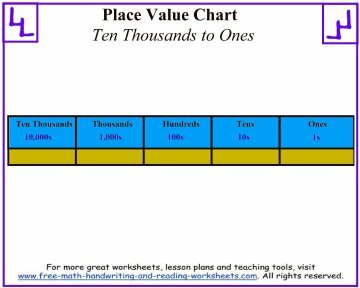 Use the place value charts below to show what a digit is worth. The digit's place (or position) in a number determines its value. In the example, 2 being in the ten thousands place gives it a value of 20,000 or 2 times 10,000. To put it another way, moving from right to left across the number (ones to tens, tens to hundreds, and so on), the value of a number is increased by ten times. 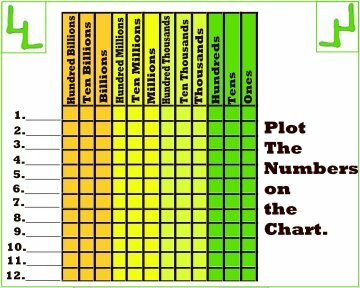 Have your students practice writing their numbers out on the charts below so that they can clearly see place value at work. You can tailor these charts to your own classroom lessons or home-school plan. 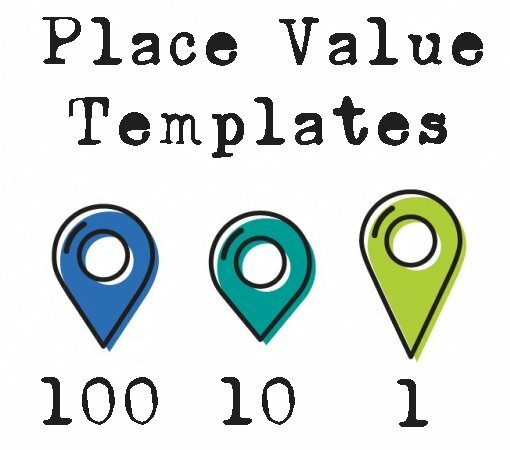 Using the printable template below, your child can see how place value is distributed within a number. Click the photo to download and print out your worksheet. As you move into larger numbers, commas are used to separate family groups into three divisions. All family groups (billions, millions, thousands, and ones) can be separated into 100, 10, and 1 value groups. For example, millions can be separated into 1 millions, 10 millions, and 100 millions. Some children may become intimidated by larger numbers, but if you can show them how it's just a reiteration of the basic ones, tens, and hundreds (with a lot more zeroes behind them) they may find them easier to handle. Commas are used to separate groups of numbers like billions, millions, thousands, and ones. Using the template below, the first comma is read as billion, the second as million, and the third as thousand. I've included a decimal point in the ones section signifying an end to whole numbers. You can find decimal point charts at the bottom of this page. The final template is a blank worksheet that can be printed out and used for practice. Simply write some numbers on the line for your child or students to graph on the chart. 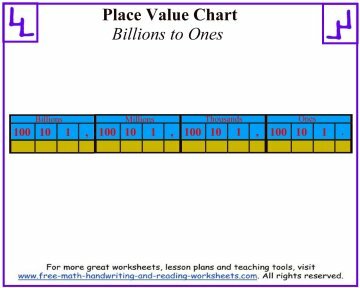 You can also check out these sample worksheets using Place Value here.